Our goal is to be able to offer transit information as an alternative to driving directions wherever possible. Let's say you plan a visit to London. For a long time you wanted to visit Tate Modern, but how do you get there? Simple! You do a search for Tate Modern on Google Maps, and then click on "More" and activate "Transit". Now you can see nearby Tube stations and which lines serve them. You can even click on a station and get passing lines highlighted. For agencies that are a part of Google Transit, you can also find schedule data and itineraries. The full list of cities is Belo Horizonte, Berlin, Bordeaux, Brasilia, Cairo, Capetown, Caracas, Chicago, Copenhagen, Dallas, Dortmund, Duisburg, Düsseldorf, Ekaterinburg, Essen, Frankfurt, Genoa, Guadalajara, Hamburg, Helsinki, Johannesburg, Kazan, Köln, Lille, Lisbon, London, Lyon, Madrid, Marseille, Medellin, Mexico City, Monterrey, Montreal, Munich, Naples, Nizhniy Novgorod, Oslo, Paris, Perth, Portland, Porto, Porto Alegre, Prague, Pretoria, Recife, Rennes, Rio de Janeiro, Samara, San Francisco, Santiago, Sao Paulo, Seattle, Strasbourg, Toulouse, Tunis, Vienna, Warsaw. I'm pleased to announce the launch of the Transit Layer on Google Maps in more than 50 cities around the world making it easier for citizens and tourists around the globe to access public transportation line information in their cities. If you want to book a hotel or make a restaurant reservation you can switch on the Transit Layer and look for the public transport line nearest to the location. If you want to travel from A to B you can quickly familiarize yourself with the public transport network and find out which lines to use and where to change. The Transit Layer is a part of Google Transit. 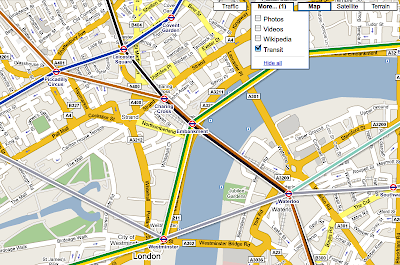 Whereas the main Google Transit product has the goal to provide full schedule information and routing, the objective of the Transit Layer is to overlay lines visually on Google Maps. Think of a virtual metro map on top of Google Maps -- even when we don't have itinerary planning available, we want you to be able to see public transit options that are available. Our goal is to be able to offer transit information as an alternative to driving directions wherever possible.